A scroll saw is a very handy tool if you want to do the intricate cutting on a variety of materials. Mostly used by hobbyists and those that make pieces that require accurate and complicated cuts, you will most likely see a scroll saw in the workplace of a serious woodworker or machinist. But what is a scroll saw exactly, and how does it work? Here, we will discuss the parts of a scroll saw and how they work in a mechanical combination to produce intricate, fine, and smooth shapes for different purposes that you would have a hard time doing with any other tool. With the information provided, you may even feel the need to acquire one for your own crafting needs. A scroll saw is made up of multiple parts, but basically what it does is that it moves a very fine toothed blade up and down very fast, and the worker will be the one that will guide the piece towards the blade so that they will cut in the direction that they want, be it curves, straight lines, or other shapes. Other parts of the scroll saw are used for other functions such as setting up the blade and its movement, guiding the piece that is being cut, or making the cutting process easier and more convenient. All of these are discussed comprehensively in the section below. Despite being a device with a simple concept, a scroll saw has multiple parts that work in tandem to give you the results that you want. As such, what is scroll saw is a combination of mechanisms that, along with the user, will allow for precise accurate and smooth cuts on almost any type of substance. Each important part is described in detail below, along with where they would be usually found. Some terminologies that you would be hearing when working with scroll saws are also discussed for your appreciation. The bevel scale is a ruler like a scale often located at the bottom of the scroll saw table. It has numbers listed on its surface which represent the degrees of the angle that the table is positioned. Usually, bevel scales have a range from 0 to 45. Bevel scales are needed so as to provide a guide for the worker on as to the angle that the pieces that they are working on will be cut. This is important for beveled projects or cuts that are not straight through the material. As part of the machine’s safety arrangements, the blade guard looks like a two-pronged fork that is found between the table and the top blade clamp. It is supposed to surround the blade except for a small area in front. Blade clamps can be slightly bent upwards in a curve or completely raised at a right angle depending on the model of the saw. The blade guard serves two main purposes. It prevents the material from rising from the table, which may result in inaccurate cuts. Perhaps more importantly, it prevents your fingers from accidentally touching the blades during operations. This is extremely important as a scroll saw blades can cut through the skin very quickly. The blade guard lock knob is a knob that is located near the section where the blade guard connects with the arm. It is often black and can be screwed in and out with locking features. However, this may not be present in some scroll saws. The blade guard lock knob is used to set the blade guard higher or lower. This is needed especially for thicker or thinner pieces so that they will be kept in place better for more precise cutting. Scroll saws, especially the popular ones, include two blade holders in a scroll saw one at the bottom and one at the top. There is a clamping mechanism that will help in holding the blades in place. Knobs on the sides of the holders will tighten or loosen the clamps. Blade holders, as the name implies, will hold the blades in place. Loosening the knobs, in turn, will allow you to replace the blades quite easily. Blades can be set or can be threaded through a pre-drilled area of your material for inside cuts without going from the edges. What is a scroll saw without blades? The blade tooth set pertains basically to the type of teeth that your blades have. Your blades will tend to be very thin and are measured in TPI, or tooth per inch. A blade with a higher TPI will typically provide finer cuts with a smoother edge. There are also several kinds of teeth available for blades. Differences will depend on where the teeth are found if there are gaps between teeth, and which directions the teeth are pointed. The standard tooth blade has teeth facing downward and has no gaps. Different types of blades have different cutting speeds and are designed for cutting different materials or shapes. Deflection can be seen as you push the material into the blade. This is a normal behavior of the blade when cutting, so you must be able to adjust it accordingly. As a standard rule, scroll saw tension should be just enough so that the blade would move at an eighth of an inch at a maximum. The feed means the speed by which your material will go through the blade. Very fast speed is necessarily not good as you might damage your material as well as your blade. On the other hand, a slow feed will hamper your progress. Through practice and experience, you will be able to balance out your settings and the speed of your feed for optimum performance and quality. Kerf pertains to the width of the cut that is being made by the blade. Logically, a thicker blade will result in a wider kerf. The positioning of a blade’s teeth will also affect how wide of a kerf will be produced. The sawdust blower is a tube that runs from the upper arm of the scroll saw towards the blade. It is situated as near to the table as possible without touching the material. More often than not, it is located very near the blade guard. The purpose of the sawdust blower is to blow away sawdust and other debris that would be emitted during cuts. This is a convenient feature as you will freely be able to see the surface of the material that you are cutting without dust obstructing your view. The table lock knob is a knob located at the bottom of the scroll saw, typically near where the bevel scale would be. It can be tightened and loosened accordingly. The table lock knob is used to lock the angle that you would prefer the worktable to be in. Once you have checked the display on the bevel scale, you can tighten the knob so that the worktable will not move around during cutting. The tension knob is a knob that is located at the top section of the scroll screw, typically on the arm. Typically, this knob is at the back or front of the arm depending on the model being referenced. The tension knob controls the tension of the blade. Tension means how much give the blade has when a material is pushed against it. Tension must be set just right in order to get the cut that you want. The upper arm looks like a bar, although sometimes the arm is connected to the base of the scroll bar in one continuous structure. The upper arm can also come in different shapes and sizes but typically makes the scroll saw into a “C” shape. The upper arm is where most of the mechanisms of the scroll saw reside. It houses several controls for the scroll saw and it also contains the mechanism that allows the blade to move and cut. The variable speed control knob is a knob that may be found in different areas. Usually, the variable speed control knob has numbers on them and serves more as a dial rather than for tightening or loosening. The variable speed control knob controls the SPM, or Strokes per Minute, of the blade movement. Speed needs to be controlled when cutting, the details of which are discussed in the succeeding sections. The worktable is the flat surface in between the two blade clamps. Worktables have varying sizes depending on how large your scroll bar would be. Worktables have a hole in the middle to accommodate the blade passing through. You will be placing the material to be cut on the worktable. Afterward, you will slide the material along the table in the direction that you need. Worktables can be moved at the angle that you desire using the table lock knob mentioned above. The scroll saw motor is the mechanism that allows for blade movement. Most modern scroll saws use electrical power for this. The speed of the scroll saw motor can be adjusted based on the user’s needs, although this may not be available for cheaper units. Typically, a scroll saw can be set at a range of 400 to 1,600 strokes per minute. Harder substances such as hardwood or metal will typically require slower speeds in order to get a neater cut. For soft substances like plastic or maple, faster speeds can be used. With practice, you will be able to determine which speeds are best for each type of substance. A good balance of tension is necessary for a scroll saw to work properly. A blade under very high tension can easily break while guiding the material through a blade that has little tension can be difficult. As previously mentioned, a tension which allows for about 1/8th inch of movement is enough in most cases. Another method of testing correct tension is to stroke the blade. If the blade produces a musical note like a guitar, then the tension is probably enough. Take note that different blades will produce different notes, just like a guitar string. Also, you should adjust tension based on your needs and preferences as well, something that you will learn through experience. 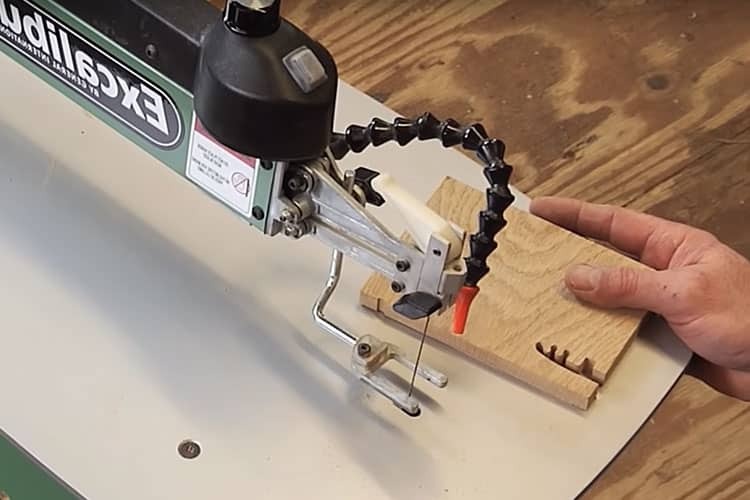 As you know by now, a scroll saw is an amazing tool that can provide you with magnificent cutting precision that you can’t find anywhere else? Of course, using a scroll saw takes a little practice, and hopefully, by knowing its parts and how it works exactly, you will find that operating such a device can be easy and enjoyable. Of course, a scroll saw can still be a very dangerous piece of equipment if you do not treat it with respect. Always focus on the task at hand when using a scroll saw, and following safety procedures such as wearing protective equipment and ensuring that everything is locked into place before operating is something that you should always abide by.